Come, you rich men, weep and howl for the miseries that will come upon you. Your wealth is rotten, and your garments are motheaten. Your gold and silver are corroded; their poison will be a testimony against you and will eat your flesh like fire. You have heaped treasure together for the last days, but—behold!—the wages of your farmworkers cry out because you have held them back. The wails of the workers who have reaped your fields have reached the ears of the Lord. You have lived in luxury and selfishness on the earth, and have nourished your hearts as on a day of slaughter. You have condemned and killed the righteous, and he has not resisted. Be patient therefore, brothers and sisters, unto the coming of the Lord. See how the farmer waits for the precious fruit of the earth, having great patience for it until he receives the early and late rain. Be patient like this; ready your hearts for the coming of the Lord. 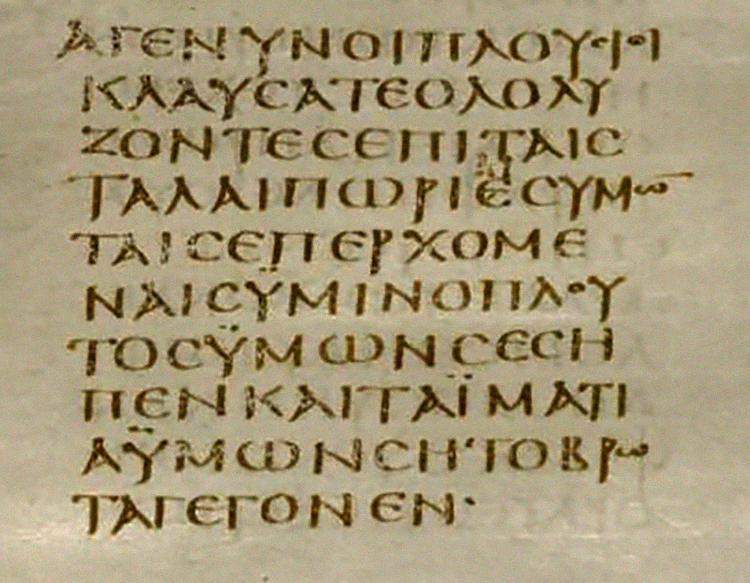 James 5:1-8; the image is from the 4th century Codex Sinaiticus, the earliest complete version of the Christian New Testament; many scholars date the Epistle of James to the late 1st or early 2nd century. This entry was posted in Uncategorized and tagged 1st Century, 4th Century, Christianity, Farmworkers, Labor, Religion, The Rich. Bookmark the permalink.